Madison here. Sorry I haven’t been able to blog yet, but I’ve been very busy. In addition to my job of keeping the sofa warm when nobody is looking, I’ve been helping around in the office. When you call and are put on hold, that’s me. I hold the phone. Literally. The soft breathing in the background is not Mom or Debbie, it’s me. While they’re using their hands to find things, I make it all possible. They used to use the hold button that comes with the phone, but I am very much more reliable. Every once in a while I do goof up. It happens. I’m sure you’ve heard of dropped calls. But hey, I do my best. 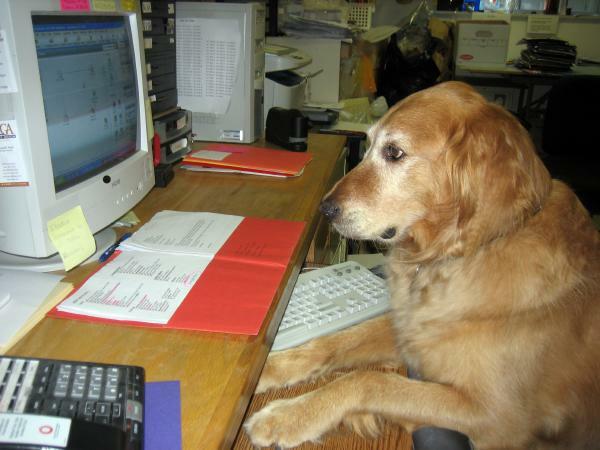 I also type up orders, but I let Debbie fill them as the sticky stuff on the flaps of the priority envelopes is hard for those of us with fur. I take messages and paper notes back and forth from one office to the other. I am a Four-Legged-Fax. I am present at all meetings. For standing meetings I lean against Mom or Debbie. For those that occur sitting down, my place is under the table. I no longer attend board meetings because they are, as the name implies, boring. I also get stuck doing all the chores nobody else wants to do, like cleaning the computer monitors. It’s a dog’s life. Entry filed under: Dog Stuff, From Under The Desk. Tags: boring meetings, cleaning computer monitor, dogs in the workplace, putting callers on hold. Madison is just a love! I know he enriches the lives of you and those around him each and every day! You gotta’ love those furry family members! I love Madison’s comments/input, I’m sorry for Madison’s Grandmom having Alzheimers. So many of Ami’s comments I can relate to, though I do not have the creative/busy life she & her family do. Madison is welcome to come live with me and my two cats who I am sure would love him to pieces. Who wouldn’t. What a terrific help around the house he is and he’s beautiful to boot. I miss Madison’s additions to the blogs when he is otherwise occupied…and if it weren’t for the pictures of His Handsomeness I keep forgetting that he is a what he is! Madison reflects the love of his two legged companions…and sense of humor. What a blessing he must be for you Ami! Oh, Madison ~ how we could use your abilities at the law office where I work… let me know if you’re interested!! Lots of dog lovers work there – Westies, Labs, Retrievers, Shih Tzu’s, and many other All-American canine-types… some of them even come to visit (especially on bring your dog to work day). I love Madison. His postings are always so charming and erudite! 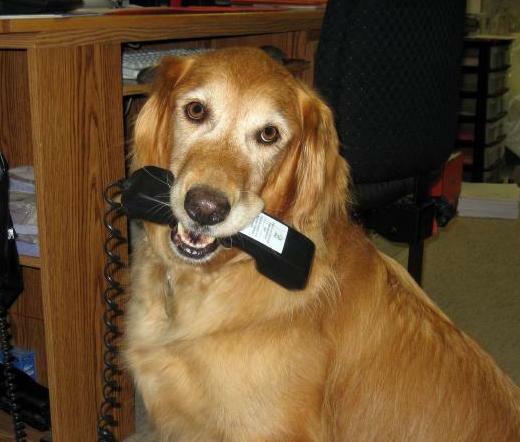 Madison, maybe you should record your panting and include a few barks and yips, then others could use it on their systems. It would be more relaxing than some of the muzac I hear when I’m on hold. Wow Madison is such a talented dog. Does he do laundry and ironing? Hi, Madison~ I’m impressed with all your office skills, you have quite a nifty resume. Mom is very lucky to have such a talented and dedicated helper! (Mrs. Goodneedle’s occasional stand-in blogger). You’re sooo very lucky to have Madison. If all of us could have such loyal employees and best buddies. Madison, I miss you when you are to busy to blog. 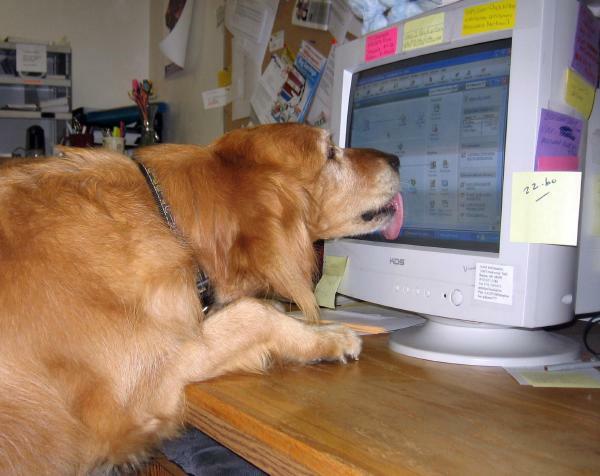 Madison, My Mom gets mad at me when I lick the screen – how do you get away with it?